Chas Morgan writes to proclaim his interest in Berry. He says that, though he works at Berea College, he deeply admires the Berry Schools and is proud that he is a Berry graduate. He requests that Martha Berry call upon him if ever there is a way in which he can be of service to Berry. 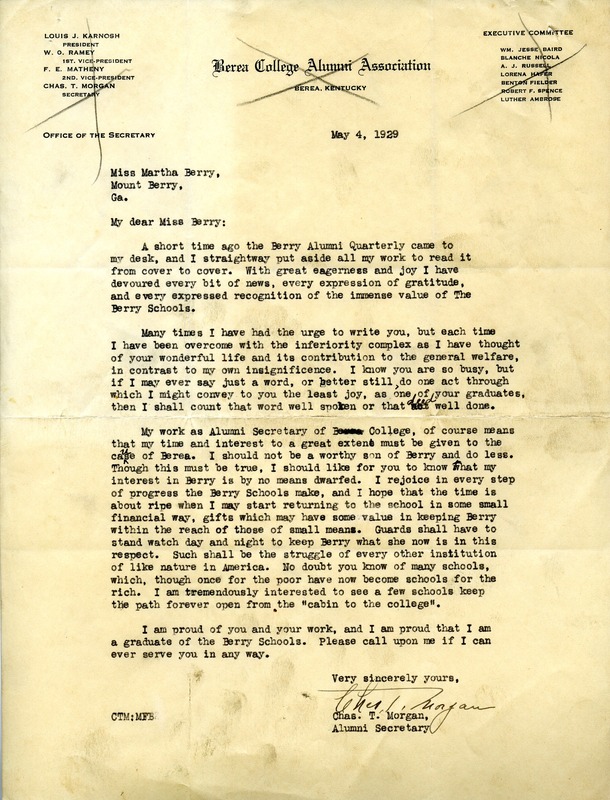 Chas T. Morgan, “Letter to Miss Martha Berry from Chas T. Morgan.” Martha Berry Digital Archive. Eds. Schlitz, Stephanie A., Daniel Warner, et al. Mount Berry: Berry College, 2012. accessed April 22, 2019, https://mbda.berry.edu/items/show/10670.